I keep hearing about cauliflower rice, but I hadn’t thought much about cooking with it until I spent 30 days trying out the Whole30 diet (more on that another time). 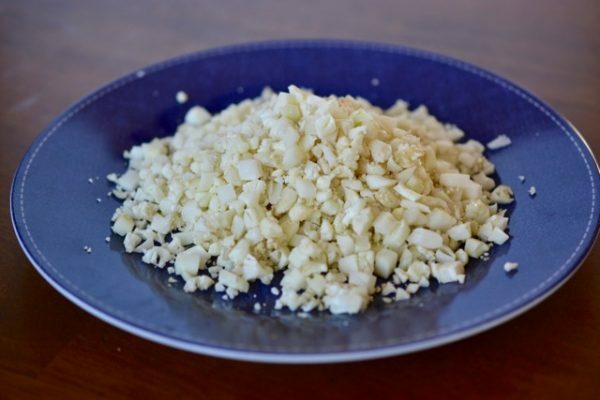 Cauliflower rice is great if you’re eating paleo, grain-free, or veggie-centric…but I hadn’t really thought about making it because it sounded like more work that I was willing to deal with for cauliflower. But then I started seeing it sold already “riced” in packages as “cauliflower crumbles” or some variation, and suddenly it seemed a lot more convenient. And that’s when I finally realized – it’s so good! Depending on how you cook it, it doesn’t have to taste like cauliflower at all. For instance, I’ve been making it for breakfast by sauteeing it in a pan, adding some other chopped veggies, and then adding an egg or two to make “fried rice” – It’s SO tasty, and you will never miss the actual rice. 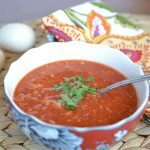 This Tomato Cauliflower Egg Drop Soup came about on a chilly day when I felt like making soup but didn’t want anything too heavy or complicated. Time-wise, it’s a winner – it’s done in 30 minutes. 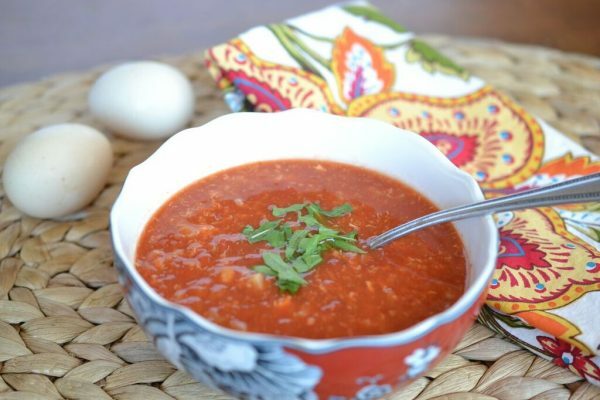 And comfort-wise, it brings me back to days of my childhood when my mom would make tomato egg-drop soup. A sugar-free, grain-free soup that is ready in just 30 minutes. 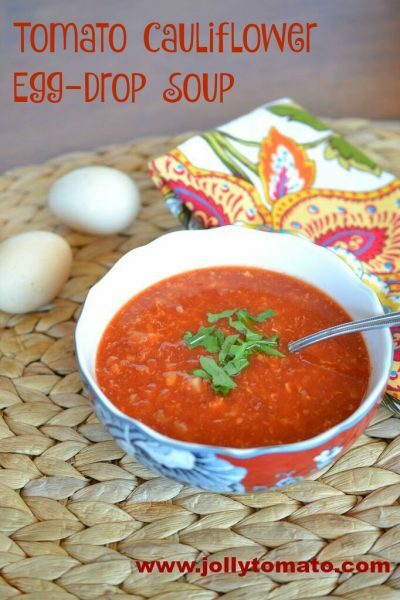 Pour the chicken broth and crushed tomatoes into a large saucepan; bring the mixture to a boil. Add the riced cauliflower and reduce heat to a simmer; simmer uncovered for 25 minutes, stirring occasionally. Pour the beaten egg into the soup and stir rapidly so that the egg pieces break up. Allow the mixture to simmer for two more minutes so that egg is cooked. Add salt and pepper. Serve immediately. Serve it with a nice salad and some grilled chicken and you’ve got yourself a seriously hearty meal. Have you tried cauliflower rice yet? What’s your favorite way to use it?